- Changed the Region select screen layout, now use A+B+C to change region. - Region and cheats auto disable themselves if a Universe Bios is installed. - System region is the default region used by the converter (see notes below). - Entry and exit from the cheat menu is cleaner. - Changed Red color in the cheat menus to Yellow. - Art of Fighting 2 now works without the need of using the button on the converter. 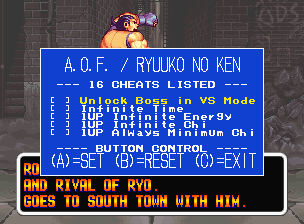 - Region select now shows correctly if game used is an original KOF 2003. - Region select now shows correctly if game used is KOF 10th anniversary extra plus. from the included CD with the converter if you have not done so already (its in the root dir). 'C:\Program Files\NEO2\Manager\Kernal_Kit\BATCH' depending on your operating system. - Place both MagicKey_v2_main.bin' and 'MagicKey_v2_verify.bin' to your root 'C' drive. - Run 'NEO2 Kit Kernal' from your PC desktop (or located in the NEO2 Manager folder from start menu). - Choose 'MagicKey_v2_bios.xml' from the list on the right if it has not been auto selected. - Attach USB lead to connect converter to PC (ignore the error message). - Press the 'start to run' button and let the device program and verify. using the information below. USE WITH CARE!!!! If in doubt do not change!!!! You must apply the patch to both 'MagicKey_v2_main.bin' and 'MagicKey_v2_verify.bin'. And now the only way I can get the converter to work is if I hold the black button that skips all the magic key stuff. Any help? How can I restore my Magic Key? 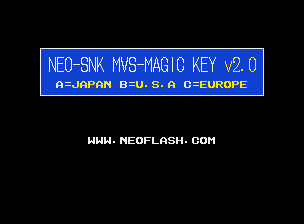 1. download the last v1.32 neo pro manager and install, then use the kernel to burn menu again. 2. plug the usb cable to the main board back-side USB port, to link the magickey.